Deciding on taking a 300 hour training is an exciting and big decision. This training is not only more intensive in the amount of hours, but also the content and depth of the learning is of a more advanced nature. Often described as the Level 2 yoga teacher training course, many of the 300 hour yoga teacher training Bali experiences that are on offer are based on continuing education in yoga teaching skills and yoga philosophy and practice, after having completed a 200 hour yoga teacher training. If you are considering joining a 300 hour yoga teacher training Bali, then there will be a few different elements that you’ll take into account when assessing your decision. Below we’ve compiled an easy and informative way to explain some of the most frequently asked questions from people who are on this next phase of their yoga journey. 300 Hour Yoga Teacher Training Indonesia | Why Here? There are many reasons as to why Bali, as part of the South East Asian archipelago Indonesia, is a hotspot for yoga practitioners. Read more about the history of yoga in Bali for an in-depth view at this island’s roots of yoga. It’s accessible for people travelling, and who wish to stay for one-month or more (which is often how long 300 hour yoga teacher training courses go for). Costs of airfares, even from Europe, are quite affordable. Visas are easily obtained in any home country, or at the airport when you arrive to Bali for a short stay visa. It’s cheap to stay and eat. As with most South East Asian countries, you can find clean, comfortable accommodation for as little as $7 USD, and meals range from $2 USD and up. There’s a plethora of healthy vegan food. Ubud, where most trainings take place and some of the most well known yoga studios are situated, is known as one of the easiest places in the world to be vegetarian and vegan. The food is hailed as world-class, with even an annual food festival bringing international foodies to the island. The standard of yoga here is high. As the island draws in people to lead and take part in trainings, or to immerse themselves in yoga for an extended time, many people also want to teach here. The demand of teaching means that the people who do offer classes and courses are generally of a high standard and give quality yoga experiences. Everyday activities are very connected to nature, as the jungle is literally on our doorstep. This natural environment, as well as the slow pace of Bali life, allows people to relax and drop in to a more receptive state. This energy is perfect for taking a yoga training and absorbing the material, whilst feeling held by the rich green of the trees and the cleansing air of the tropical rain. Bali is deeply rooted in its spiritual traditions. With daily offerings, weekly ceremonies, and a clear connection to spirit and their religion allows us to witness the energy of Bhakti (devotion) that we experience in yoga. Many practitioners report feeling more able to connect within to their own spirituality, whatever that may be. Word of mouth, articles, blogs and recommendations - word travels fast. 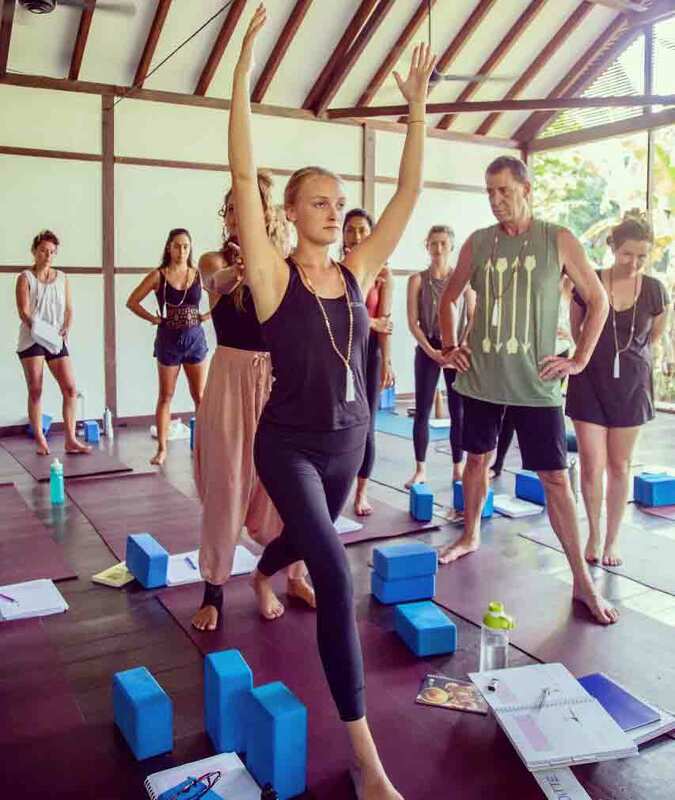 Yoga teacher training Bali courses have come into popular interest for yoga lovers because the positive experiences people have here are shared, and recommendations are some of the most trusted ways that help people’s decision making. What’s the difference between 200 hour and 300 hour trainings? Put simply, 200 hours is the level 1 yoga teacher training, and 300 hours is generally the level 2. It will depend, however, on the school offering the training. Some schools may hold a 300 hour level 1 training, or even 500 hour trainings. These may encompass no particular ‘level’, but instead contain in depth content that would be addressed in level 1 and 2, in a longer and more rigorous format. You’ll find many of the 200 hour yoga teacher training Bali courses are the entry into yoga teaching, as they are the level 1 courses offered to people who have not yet done a training, or who are looking to go back to do another level 1 for experience/in a different style, etc. The 300 hour yoga teacher training Bali offers are generally the level 2 option. Open only to those who have completed a 200-hour or more. You can take as many trainings you please. Most school also allow you to join the level 2 that they are holding, even if you haven’t completed your level 1 with that particular school. Simply, the most basic difference of these trainings is this: the 300 hour yoga teacher training is 100 more than the 200! That means more content, practice, and often more days that the training will be completed. What are the most common 300-hour trainings in Bali? Vinyasa yoga teacher training courses are some of the most common yoga trainings offered in Bali. There are a range 200, 250, 300 hour (and sometimes courses with more the 300 hours) available, all with different yoga schools offering their specific method of teaching their style of vinyasa. Additionally, you’ll find Hatha trainings, Yin, Restorative, Ashtanga and more here. Where in Bali can I take a training, and how long do they go for? 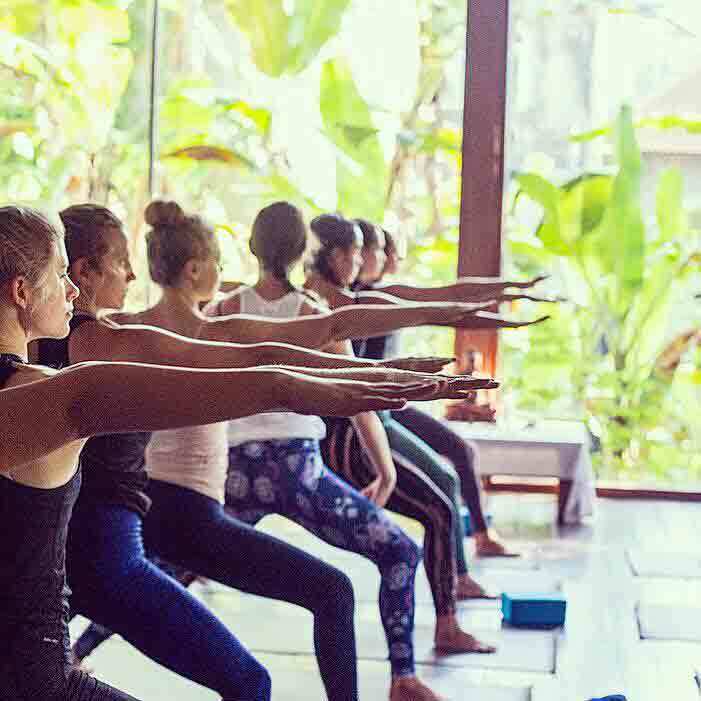 Ubud is the go-to spot for teacher trainings in Bali, though there are some schools that offer trainings at their studios in coastal towns of Canggu, Uluwatu, Sanur and even the islands surrounding the mainland of Bali, such as Nusa Lembongan. 300 hour trainings can start from one-month, and lengthen to basically any time period above 30-days. Since the one-month trainings are also commonly 200 hour, this means that the 300 hour training has longer days, and generally more activities to complete pre-and post training to get those 300 hours for certification. In Bali, the trainings are mostly the intensive style courses, as people travel to Bali having a limited time away from their responsibilities and regular lives, and choose to take the immersive schedule of a one-month training. When I complete 200 and 300 hour, what does that mean for certification? Registering with Yoga Alliance comes with a credibility that studios who will hire you are looking for so that they trust in your training, and in the Western World, many studios require you to be registered with Yoga Alliance. It then becomes easier to be insured, and to eventually run your own trainings, if that’s something you’d like to do. If you have more questions about 300 Hour Yoga Teacher Training Bali, feel free to browse our trainings page on our website, which offers information about the way that we hold trainings here in Ubud. You can also reach out and ask questions to one of our studio team, by email or phone.